Suppose you are at a new clients, and you want to see quickly all the orchestrations are bound to send and receive ports. Here’s some code to help you get started with that. Sorry, can’t show any actual results at this time. This is similar but different from a prior SQL xref I posted that ties RecievePorts to SendPorts. I actually forgot about this, and did the same code again on another day: Xref BizTalk Receive Ports to Orchestrations. "'Newtonsoft.Json' already has a dependency defined for 'Microsoft.CSharp'"
In my case, I was at a client running Visual Studio 2013 and needed to upgrade the version of Nuget. 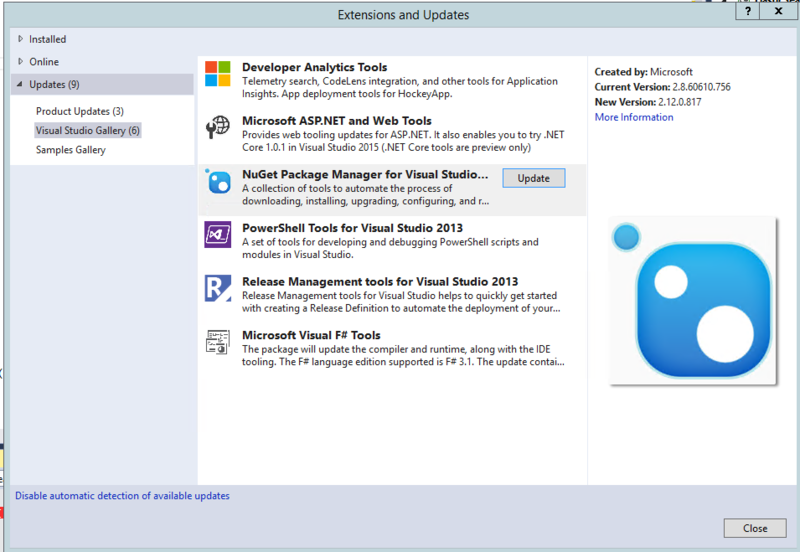 In Visual Studio: Tools -&gt; Extensions and Updates -&gt; Updates tab -&gt; Visual Studio Gallery.